Resin bonded drives are all the rage these days for the obvious reason that they provide a great looking gravel hard-standing without the drawback of loose gravel but are they a job for the general builder or should you sub them out? There are two distinct forms of resin bonded drive. 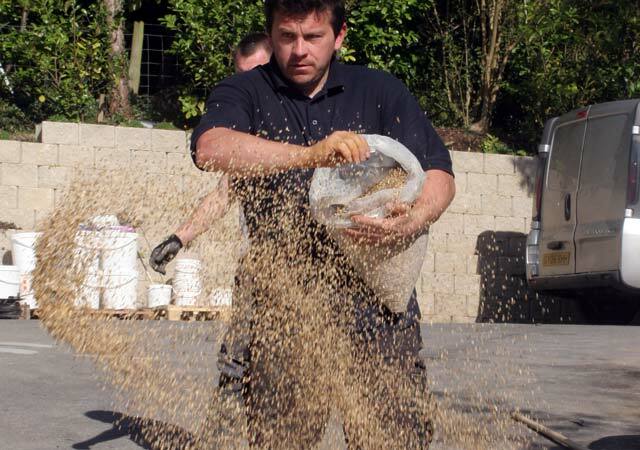 One is where the gravel is mixed in with the resin and trowelled on in the same way as a screed, the other is a broadcast method where the resin is spread across the surface and the chippings are then thrown across it. 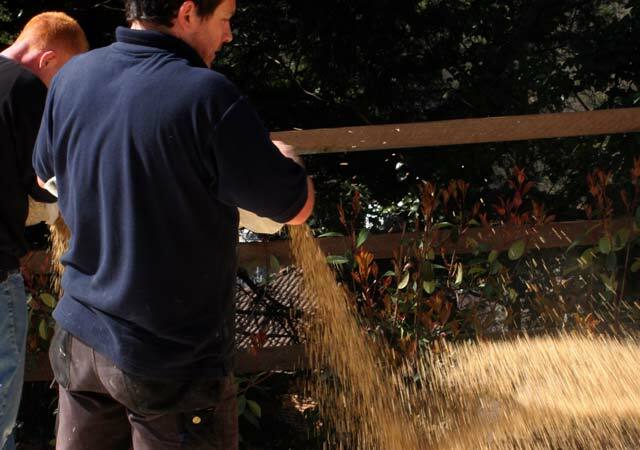 Those chippings that make contact with the resin are fixed and the loose can be swept up for reuse. 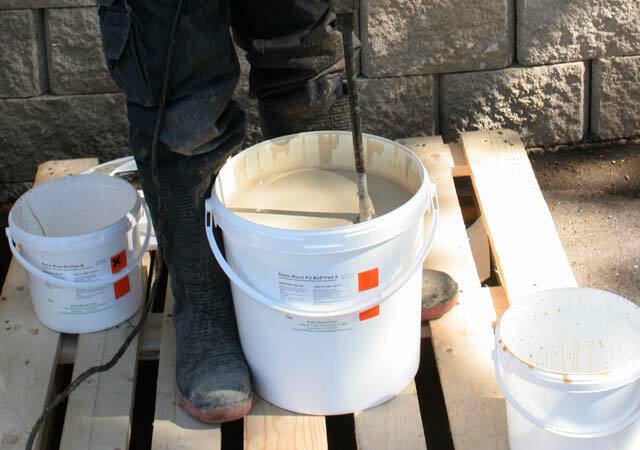 The mixed resin method requires a special mixer so it is more likely that the builder will sub this job out but the broadcast method is easier because it requires very little outlay for tools. Ideally, some training is required because you are dealing with a two pack product. Material suppliers can offer this. Like anything that has two different methods, there is a difference of opinion as to which is best. Generally, the broadcast method is considered more suitable for driveways as it is harder wearing and has excellent skid resistance. The trowel down method is a smoother surface which some prefer but it can be slippery when wet. This can be cured with a non-slip coating. Similarly, the broadcast surface can be sealed with a clear resin to resist staining and enhance the colour. Once this is done it is often difficult for the untrained eye to see a difference between trowel down and broadcast. Like so many wet trades the secret to success is the ability to work clean and time the job to produce a steady workflow. This takes a little experience and you are much better off starting with a small area. Like so many wet trades the secret to success is the ability to work clean and time the job to produce a steady workflow. This takes a little experience and you are much better off starting with a small area. 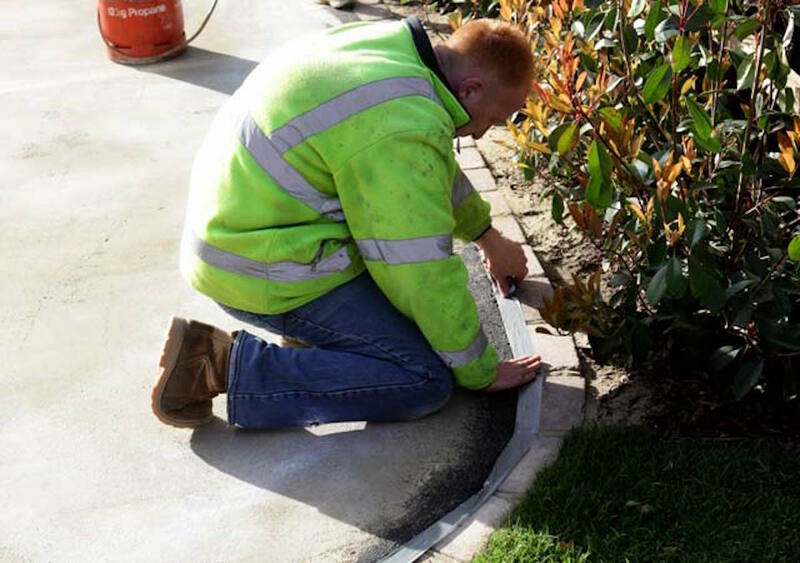 On a concrete substrate, at the very least, you need to carry out a thorough jet washing and acid wash to remove any loose or weak material or even laitance. If you are working with old tarmac that is sound then you will probably be fine but on new tarmac, you need to leave it at least 28 days, or in any instance allow for the oily bituminous residue to dissipate, or this will not allow the resin to adhere properly. It is not normally necessary to prime a clean dust free surface, although primers are available for a belt and braces approach. The next step is to mask up the areas you need to protect. The resin needs to be applied right up to the edge so time spent on masking is going to make the job easier and neater. The surface needs to be bone dry which can be a problem in Britain. If there is a shaded area that looks a bit damp it is worth running a roofers blowtorch over it. You may be tempted to wait for a nice hot day but the two pack goes off a lot faster in the heat so on the first couple of jobs you really need to pick an overcast day or start early in the morning. As you get to know the materials you will learn when you can push your luck. When you are ready to lay you need one person mixing the resin and another on the squeegee and, if you can manage it a third person on the gravel. As you become more experienced, if the job is small, you can do the job with two people but the first time it is better to go in mob handed. A notched squeegee is a tool you can’t do without because it makes sure the bed of resin is even rather than having thick and thin parts. As the notch lines begin to sink into the mass you can begin casting the gravel. Ideally, you need to avoid walking on the finished surface for a few hours but when broadcasting the gravel it is sometimes hard to avoid. If you need to go on it then smooth soled shoes are essential and walk very carefully so you don’t kick up the gravel. On the job shown here there was a steep sloping section of drive and this, for a beginner, is not good because the resin can run and slump. Again this underlines the value of the one-day training course. Contact PICS Newbury for details of resin bonded gravel drives materials and one day training courses. Check out our new feature on DIY resin bonded drives from Vuba Building Products. Spiked shoes for walking on the resin are essential. More broadcasting of the gravel. Previous What will 2018 have in store for the construction industry? 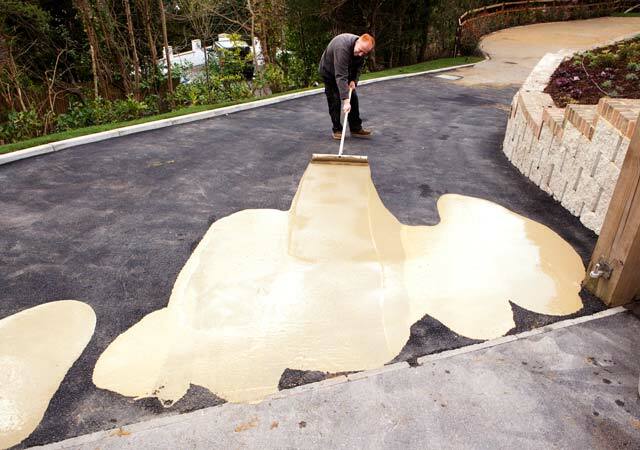 Dear all, I felt that I must ad to thread that if a resin driveway weather resin bound or bonded is installed correctly and a good quality resin is used as well as a good clean aggregate then there should be no problem. 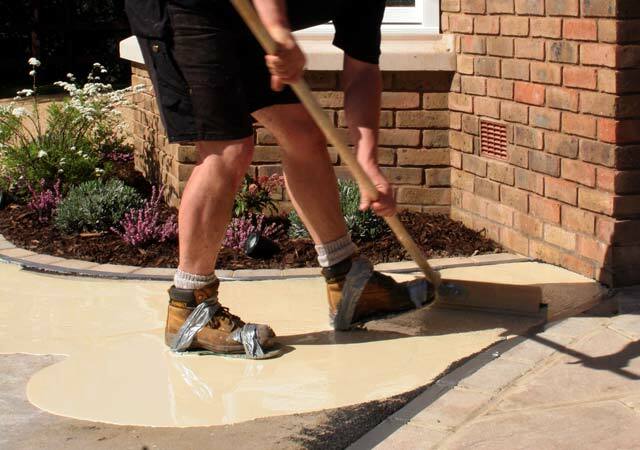 Unfortunately like many trades, over recent years there have been a few people that have professed to be able to undertake the installation and process of laying resin bonded driveways just to earn a quick bit of cash and have used either cheap resin or an aggregate that didn’t come from a reputable supplier. The art of in stalling a professional Resin Bound Surface or Driveway comes from many years in the trade/game and can not just be picked up over night or even learnt from a few days training, you need to employ an experienced company that has many years experience, which brings me to why I have added to this thread and am willing to answer any of your questions. For note only have I been installing Resin Bonded Driveways for over 15 years but also Resin Bound Driveways and Permeable Driveways. I hold the U.K and European patents in Resin Bound Paving as well as trademarks and have installed many hundreds of Resin Drives, Resin Bonded Driveways and Resin Bound Driveways. Please take a look at our Website http://www.theresinbondedslabcompany.co.uk and or if I can be of any assistance to anyone then please ask and I shall try and answer all your questions. 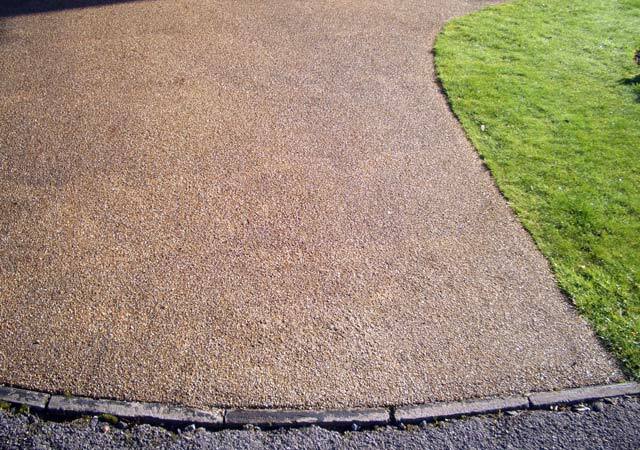 We also sell to the Trade and public Resin Drive D.I.Y Kits at very completive prices and discounts for larger orders, of course if you feel your project is to big for you to undertake but still very much want one of our Resin Bound Driveways, then feel free to contact us to arrange a free quotation. Dear All for people in the Trade or D.I.Y take a look at this website to buy top Quality Certificated and patented Resin Driveway d.i.y kits from SUDwell who have been suppliers and installers since 2009. Really useful. The best info. Thanks.